Having just returned from two weeks in India, I definitely don’t miss the honking: it’s enough to make Rudy Giuliani rip out the rest of his hair and run crying into the bosom of Daddy Trump. But I do miss the cute little tuk tuks, bobbing and weaving through traffic Mario-Go-Kart-style. So, you can imagine my delight when I passed by the newly soft-opened Williamsburg Hotel and saw this gleaming new ride outside. By now you may have heard that, hot on the heels of opening Westlight on the roof of Williamsburg’s shiny new William Vale hotel, Andrew Carmellini has opened his bottom-floor restaurant, Leuca. Grub Street noted that the Italian spot is serving “New York’s most elegant sundae,” which will surprise no one who’s had the decadent, over-the-top La Fantasia di Doppio Cioccolato at one of the chef’s other spots, Locanda Verde. 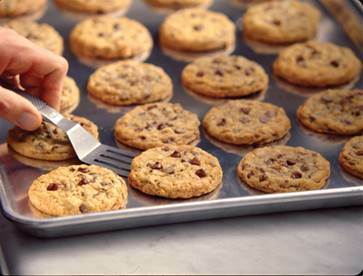 Did you know this Thursday is National Chocolate Chip Cookie Day? It might get a little confusing, as National Chocolate Chip (sans cookie) Day is May 15 and National Cookie Day is December 4, but rest assured there’s also a day specifically for these classic treats. Travel to almost any international city, from Berlin to Lima, and chances are you can to drop your bags at a cheap hostel filled with bunk beds and Ikea furniture, hassle free.